Well 1st step is to create the GUI and make it resemble TSAdmin, so we create a new Application and we place a Mainmenu, Toolbar (set Edgeborders to ebTop for the horizontal line) and Actionlist on it. Then we add a Treeview (set it’s Align property to alLeft) and a Splitter. Next add a bevel and a Panel, set Align to alClient and BevelOuter to bvLowered. Add a PageControl (align alClient) with 3 Tabsheets to the Panel and place a ListView on each Tabsheet. As you can see on the screenshot it’s already starting to look like TSAdmin after adding the Menus and Toolbar buttons. Launch a process in a Terminal Server session (see also: https://www.remkoweijnen.nl/blog/2007/10/20/how-to-launch-a-process-in-a-terminal-session/). 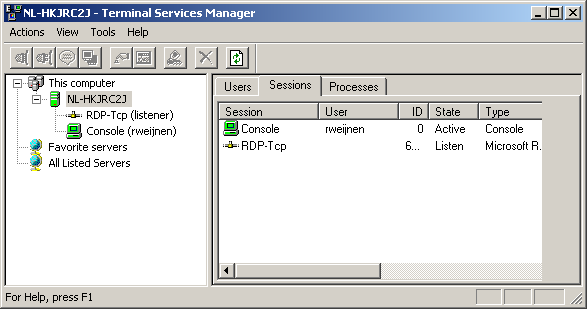 Start an RDP session to a server by right clicking in the TreeView. Add domain to the user’s listview (handy for Multidomain environment). – Remember our connections after close TSAdmin by Default (The default in the original is not remember them). – Alphabetically organize the list using a non case sensitive organization (Today the TSAdmin organize, but if our smart users type their login using capital letters, we need to search almost the entire list. For a few users no trouble, but for more than 500 users, it suckz). 2. Do you mean Active Directory Users & Computers properties screen? Is TSAdminEx available for download? I would most certainly want to test it as I cannot find a tool that would do this. Have you had any issues with WinStationQueryInformationW() and the resulting _WINSTATIONINFORMATIONW object returning zero in WinStatInfo.Status.Output.CompressedBytes property, under Windows Server 2012? I have an application that extracts the bytes of the session (which was built with your help, thanks again!) and works on everything except 2012!